The lesser long-nosed bat, a frequent Tucson visitor, and the federally-endangered Mexican long-nosed bat, are migratory pollinators and nectar feeders that depend on populations of wild agave. Agaves spend their lives building up sugars for the moment when they send a massive flowering stalk up into the sky. The flowering stalk is what provides food for bats and allows for bats to play their pollinating role, moving pollen between plants all along their migratory pathway from central Mexico up into the southwestern United States. Unfortunately, agaves farmed to produce spirits like tequila and mezcal are harvested before they flower, as are wild agaves. Together with land conversion for agriculture, development, and climate change, there’s tremendous pressure on the availability of flowering agave, threatening these bat populations. Bat Conservation International (BCI) www.batcon.org recently initiated a binational approach over the next ten years to bring about a more sustainable tequila and mezcal industry, to restore wild agave at scale, and to provide agave foraging habitat in a “bat-nectar corridor” from central Mexico to the southwestern United States to improve the conservation status of these pollinating bats. As part of this Initiative, and in conjunction with the Tucson Agave Heritage Festival https://www.agaveheritagefestival.com/, BCI will be conducting the first Tucson city-wide Agave Planting Event on April 27, 2019 at several sites across the city. The planting sites include Sanctuary Cove https://sanctuarycove.org/ with the All Creeds Brotherhood, at three sites with the Tucson Audubon Society, http://tucsonaudubon.org/ and two additional sites with Pima County http://webcms.pima.gov/. 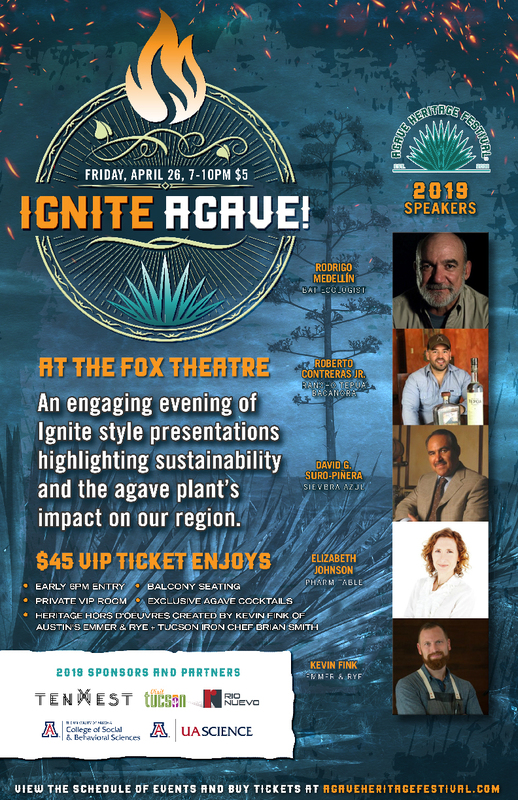 Learn more about the importance of bats and agave at Ignite Agave! on April 26th the Fox Theatre!